Herbert Holtz devoted his life to music and teaching, and to his native Hartford CT. He is remembered as a gentle and modest man who was also a hornist of the highest quality. He came out of retirement to play the obbligato part in Mahler's Fifth Symphony. At age 15, Holtz played trumpet in the governor's Foot Guard Band, but switched to horn because he was told the opportunities would be greater. 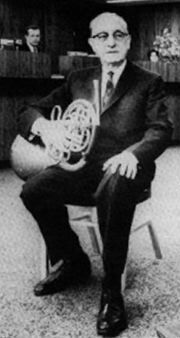 He studied horn with Joseph Franzl, who traveled from New York to play with the Hartford Symphony (then called the Hartford Philharmonic). A superb pianist, Holtz first earned his living playing for silent movies and teaching piano. Later he became principal horn in the Hartford, Springfield, and New Haven symphony orchestras. He was principal horn when the Harford Symphony Society launched the orchestra's first season in 1938, one of the musicians who offered their services gratis for a year to help the newly-formed orchestra get off the ground. In the early 1940s, Holtz played extra horn with the Boston Symphony. He passed up an opportunity to play full time with the orchestra because he preferred his native Hartford. He taught horn at the Harford Conservatory and Hartt College and gave piano lessons into his retirement. Holtz had a beautiful liquid tone, and his intonation, accuracy, and musicianship were always of the highest standards. He retired from playing in 1967, but returned to play the obbligato part of Mahler's 5th Symphony with the Hartford Symphony - and impeccable performance and just months before his 74th birthday. Holtz was elected an IHS Honorary Member in 1974. A tribute appears in the April 1981 issue of The Horn Call.